The year was 1892, and new beginnings seemed to be the order of the day. That too was the case in United States coinage, three new silver coins entered circulation that year. Sometimes these coins were identified as the Liberty Head half dollar, quarter and dime, however they’re more often referred to by the name of their designer: U.S. Mint chief sculptor-engraver Charles E. Barber. These coins were long overdue for a facelift all of these coins had carried the Seated Liberty portrait for more than half a century the Mint had had little incentive to change the designs of these coins. Only one of the three, the Seated Liberty dime, had been made in the previous decade in anything approaching normal numbers. New half dollars and quarters were barely struck at all during the 1880s, because the federal government had more than enough older coins (some dating back to the late 1840s) stashed away in its vaults to satisfy public demand. The Mint was not oblivious to the need for new designs, in their annual report for 1887 they referred to the “popular desire for an improvement of the coinage in respect to the present designs.” Not until 1890 did the inventories of older halves and quarters finally decline to the point where normal production seemed likely to resume, making the time more propitious for giving the silver coins a brand-new look. In 1890 the mint secured legal underpinning for the concept of regular design change. Coin designs could now be changed administratively after being in use for a minimum of 25 years. The half dollar, quarter and dime were eligible at once though, in point of fact, the Mint could have changed them any time it wanted under the standard procedures it had followed in previous years. In 1890 the Treasury invited ten outstanding artists to submit proposed designs for the half dollar, quarter and dime. Augustus Saint-Gaudens, the nation’s pre-eminent sculptor, headed the list of invitees. There’s little doubt that the contest would have borne impressive fruit, but before it could begin the artists got together and drafted a set of terms without which, they insisted, they wouldn’t compete. Among other things, they demanded that each entrant get $100 for each sketch that he submitted and $500 for each completed model. The Treasury turned them down and instead conducted a contest open to one and all. This produced some 300 entries, but nothing deemed usable on the coinage. Chief Engraver Barber proved to be the winner in the end. Frustrated by the poor public entries, the Mint turned to Barber in 1891 to design the coins, an assignment he had coveted all along. Barber came up with similar obverse artwork for all three coins. It features a right-facing head of Liberty with her hair bound up in a cap, a laurel wreath resting along her hairline and a diadem bearing the incused inscription LIBERTY over her brow. The designer’s initial ‘B’ is at the base of the neck. On the half dollar and quarter, the motto IN GOD WE TRUST appears above this portrait, the date below and thirteen stars alongside. The two larger coins also share a common reverse design. It depicts a heraldic eagle with a shield on its breast, an olive branch clutched in its right talons and a bundle of arrows in its left talons. Inscriptions on this side include UNITED STATES OF AMERICA along the top border, the statement of value along the bottom and E PLURIBUS UNUM on a ribbon held tightly in the eagle’s beak. 13 stars are arrayed in the field above the eagle. All three Barber silver coins debuted in 1892, and all three had steady, unspectacular careers in the nation’s coinage lineup. When the first Barber quarters were struck in January of 1892, it was discovered that the coins wouldn’t stack properly. This problem was resolved by altering the relief and design elements. Thus, there are two types of 1892 quarters. The easiest way to identify them is by the reverse. On Type I, the eagle’s left wing crosses the letter E in UNITED below the middle serif, leaving most of the letter exposed. With the Type II quarters, the eagle’s wing covers most of letter E, and the middle serif is hidden. There is also a third type, introduced during 1900, with the eagle’s wing extending beyond the top of the E.
The series has no major rarities, though 1901-S is a challenge even in low grades. There are two other “keys”; 1896-S and 1913-S, but even these are obtainable at a price. Almost 265 million pieces were minted between 1892 and 1916 at the mints in Philadelphia (no mintmark), San Francisco (S) and New Orleans (O). The mintmark can be found below the eagle’s tail. Proofs were minted every year except 1916 and totaled more than 17,000. 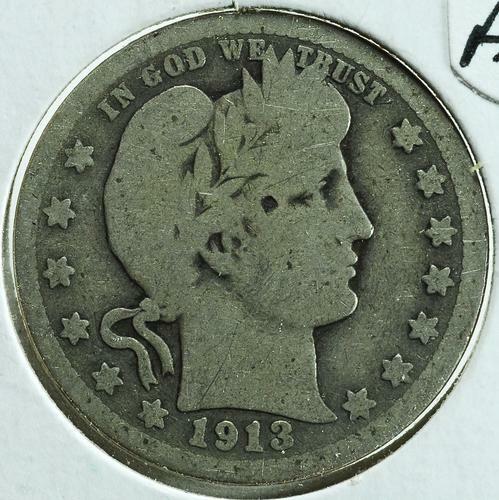 “Type” collectors particularly favor the 1892 date, as it was the first year of issue, and 1909-O, as it was the last issue from the New Orleans Mint.